is this how holiness is suppose to be? 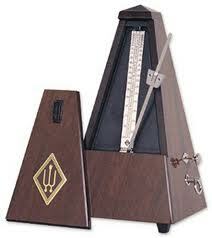 is this how we are meant to live our lives, ... by a metronome!?! impossible! today, as the song says, if you're worried about the weather then you picked the wrong place to stay - it was a snow day. as one of the comments on this video mentions, this has to be one of the best songs, ever! dude, seriously! i spent all day inside praying, "ora pro snowbis", being serenaded by SiriusXM XMU, and heard this song once again. can you be in a love with music? with a song? i remember good/bad memories learning to play the piano as a young junior higher playing with this metronome-thing-a-ma-gig! who needs that when you got a keyboardist like this one in the song! i had problems playing Mary Had a Little Lamb on tempo! wow, amazing!!! who helps me on this journey of holiness? on this journey of Faith? priests or laity? indeed, that's the wrong question! life is not about either/or, but both/and! i need the example of both good priests and good faithful people loving life, loving God! as a friend reminded me on facebook today: do what they say, but not necessarily what they do. ora pro snowbis, indeed! with the overdue snow (i love winter), many things got cancelled today - schools, i was supposed to go practice for our Creche Vivante avec l'ESCRH (be there or be square this coming Wednesday night at the local Catholic High School in Hawkesbury). i was supposed to have a Christmas party with Les Brebis des Jésus, a children's catechesis group in our parish. i celebrated the Holy Sacrifce of the Mass with the peeps in the morning, and also for the funeral of Rollande Renauld, 92 years young this afternoon. i also had extra time to do research. i found many of our friends, our brothers and sisters in faith loving life, and loving God! i was joyful when i found yet another blog by a priest(s), a classmate(s) to boot. not only one, but two - Fr. Jeff + Fr. Brad. good memories of them while in the seminary. great competition while playing floor hockey! i've add their links to these are the priests i know, i know, these are the priests i know section! then someone sent me the conversion story of my sister, Holly. check it out, yo! added to that was the new evangelization website by my brothers the Companions of the Cross. then, i've started getting pumped (spiritually) through the help of my sister Erin, youth director for the Archdiocese of Winnepeg - you go girl! then, i sit back and chill with my brother Tim (Moncton High School classmate)'s 90 Days of Music Challenge! extra coolio. of course, last week i started following His Grace and the Holy Father through Twitter. respect, yo! and with the constant encouragement i get from all of you through this digital continent, though today was difficult at times, i was on a spiritual high through most of it! no metronome needed here! sometimes you have to reset things. sometimes you have to wind them up again. sometimes you don't have to worry at all. thanks for looking out for me. i got ur back as well. all of this, of course, in this Year of Faith (year of joy! ), is making its way in the next homily(ies)! union de prière. thanks to all for the help on this journey! ps. hat tip to Joe C., for poking me into writing another blog post too. grazie!